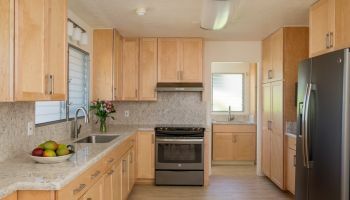 Looking to plan a kitchen remodel, an Oahu family of three recruited the professionals at Homeowners Design Center (HDC), a full-service company. HDC helped them find the exact outcome they were looking for; an area that is highly functional, stylish and that also keeps in mind the best utilization of available space. To watch the video and hear kitchen designer Jessica Omoto talk about this kitchen remodel, click on the photo below. No room to put in the new cooktop prior to the kitchen remodel. The kitchen remodel bumped back a wall and put the cooktop at an angle to create more space. Also great for hosting is the beautiful seated counter space, which was adapted by HDC in order to align with the curvature of the existing soffit—a challenge, Omoto shares, that HDC attacked (and mastered) as it does every obstacle. “We began with our best educated guess and as the process went along, worked with trusted contractors and fabricators, and as we put everything together, made sure we stayed consistent with those lines and made adjustments as we went along,” she shares—the outcome of which had the homeowners ecstatic. Aligning the new seated counter space to the curvature of the existing soffit was a challenge. The homeowners were ecstatic that they not only increased the size of the space but aligned the seated counter perfectly. After explaining the big picture, Omoto got down to the specifics of the kitchen remodel sharing just what brands, styles and materials were chosen for the area’s aesthetically dazzling accouterments. When choosing countertops, a bright quartz Silestone was chosen for its low-maintenance properties. A matching grease guard was even incorporated into the space behind the cooktop to tie the entire area together. In order to provide a nice contrast to the countertops, the homeowners chose a dark Diamond brand cabinetry for its functionality, price point and style. Modern stainless steel appliances, most of which are KitchenAid, added elegance to the updated look. 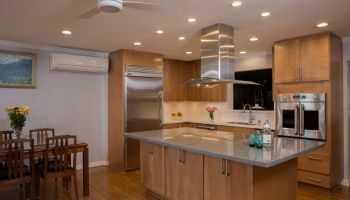 Pendant lighting and flooring, picked with the aid of professionals, which HDC was able to connect the homeowners with, completed the kitchen remodel perfectly. The final finishes of the kitchen remodel capped off what became the perfect new kitchen for the homeowners. To see more projects by Homeowners Design Center or to find out how they can help you with your kitchen remodel, click anywhere you see their name (or HDC) or on the photos above.